In July 2017, ecommerce content markers should have no shortage of content ideas, including producing articles, podcasts, and videos about national celebrations, cultural icons, and statistical data. For retailers, content marketing is the act of creating, publishing, and distributing content in just about any form with the specific goal of attracting, engaging, and retaining customers. Here are five content marketing ideas your ecommerce business can try in July 2017. 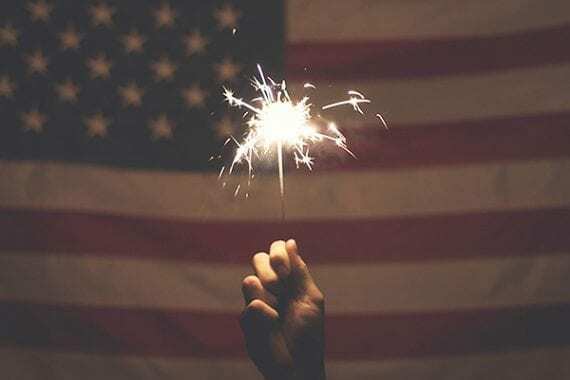 Independence Day or The Fourth of July is the peak of summer holidays in the United States. Americans will spend time with friends, play poolside or in a park, cook out, and end the day watching a fireworks display. The Fourth of July is one of the most widely celebrated holidays in the United States. Photo: Trent Yarnell. The holiday is so widely celebrated in the United States it is almost essential for content marketing in the month of July. There are at least four approaches for content development. Patriotic articles could profile American people, products, or ideas. An online retailer specializing in power tools might publish an article about DeWalt. The company has been increasing its U.S. manufacturing. DeWalt recently announced it had made more than 90 million individual tools at seven American factories in places like New Britain, Connecticut; Greenfield, Indiana; and Charlotte, North Carolina. How-to articles or videos could be tailored to match a retailer’s specific industry segment or products. For example, an online store selling premium coolers from brands like Yeti, Orca, or Pelican might publish articles like these. Entertaining content opportunities are almost boundless. For example, this 2015 Yeti video shows what happens when you set off fireworks inside of a Yeti cooler. Historical content could tell the story of American independence or even the history of an industry, brand, or product. At the London Conference in 1866, provincial leaders from Quebec, Ontario, Nova Scotia, and New Brunswick wrote the British North American Act, which created the Dominion of Canada effective July 1, 1867, some 150 years ago. Canada 150, as the sesquicentennial of confederation is often called, has been celebrated all year in Canada as the nation examines what it has accomplished and considers where it is headed. The Canadian Broadcasting Corporation released a video in December of last year offering 150 Canadian facts for Canada 150. The video is a gold mine of content marketers. For example, at about minute 2:47, Amanda Parris mentions that Canada is home to the world’s longest recreational trail. The Trans Canada Trail or The Great Trail, as it is now being called, is a network of paths covering about 13,000 miles from the Pacific to the Atlantic. An online or brick-and-click retailer selling recreational gear — from hiking shoes to backpacks — could publish a few articles, in honor of Canada 150, about the trail or even portions of it. Hormel Foods’ versatile canned meat, Spam, was first introduced on July 5, 1937. 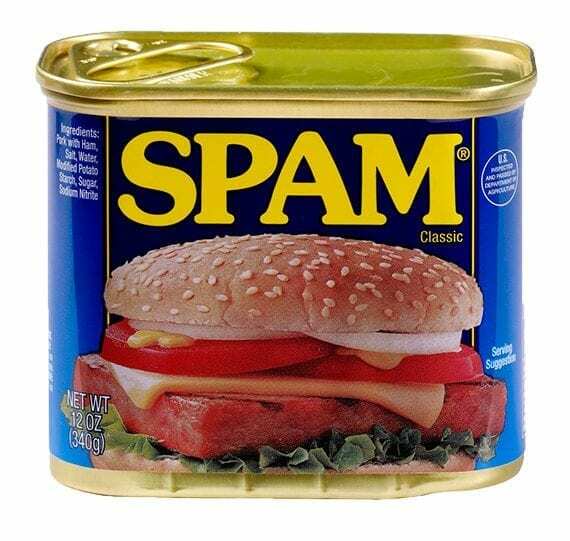 The meat, which is also responsible for the term, “spam,” as in unwanted email messages, is now made with just six ingredients: pork, salt, water, potato starch, sugar, and sodium nitrite. Spam is a cultural icon and, therefore, a significant opportunity for content marketers. Aim for entertaining or informative Spam content. Introduced on July 5, 1937, Hormel Foods’ versatile canned meat, Spam, is now a cultural icon. Here are a few Spam-related article titles for your consideration. Speaking of cultural icons — like Spam — having important anniversaries, July 29 marks 50 years since The Door’s Light My Fire hit No. 1 on the American music charts. 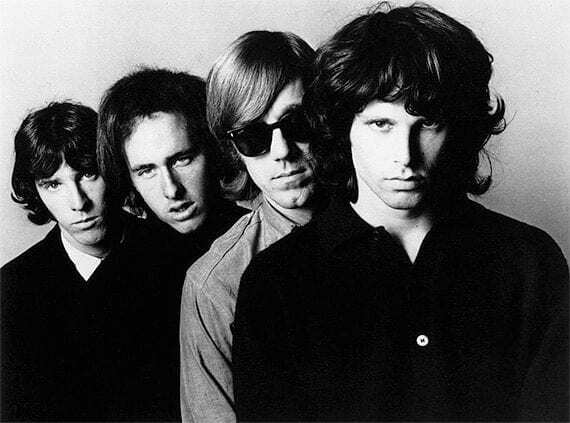 The Doors song, Light by Fire, made it to No. 1 on music charts 50 years ago. For your July content marketing, consider publishing music playlists. These can be specific to your products or audiences. Here are a few examples of music playlist titles. Audio Equipment Retailer: The Audiophile Challenge, Can Your System Survive This Playlist? Words have power. The words a business writes or speaks (as in a video or podcast) have the power to help consumers and persuade shoppers. But words are not the only tool we have for communication. In fact, sometimes a visualization can convey far more. So here is, perhaps, the most challenging content marketing idea on this list. Create a visualization using data and code to tell a useful, engaging story for your customers. For inspiration, start with The New York Times 2015 visualization, “How the U.S. and OPEC Drive Oil Prices.” Notice that as you scroll through the article the chart data changes to help explain oil prices. 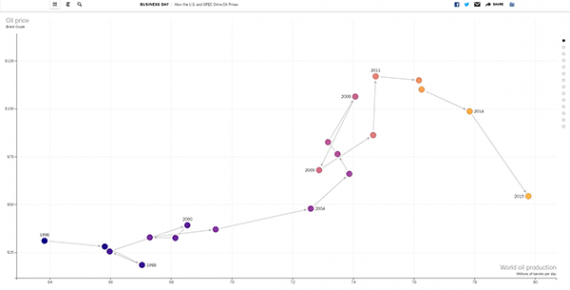 Some of the best journalism in recent years has taken the form of data visualization. Next, check out The Pudding, an online journal. 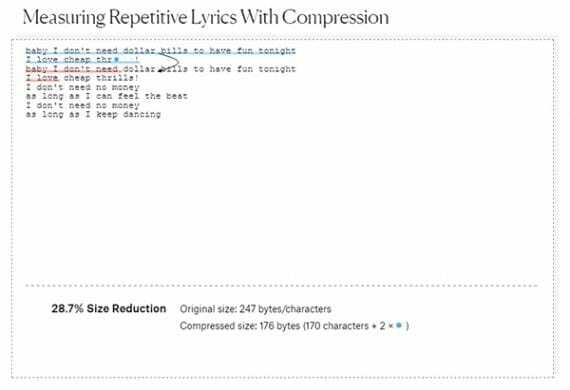 The article “Are Pop Lyrics Getting More Repetitive?” uses a simple visualization to explain how the Lempel-Ziv algorithm for lossless compression was used to measure repetition in song lyrics. Visualizations don’t have to be charts. Here the words selected with a compression algorithm are shown.